Zoisite with ruby is also known as Anyolite, it is a natural mix of ruby and zoisite crystals in a single specimen. The Zoistite is the same mineral as tanzanite, is what give the stone its earthy green colour. While the mostly opaque ruby is what add the pinky red spots to the stone. Also known as Anyolite its about 6.5-7 on the mohs hardness scale. 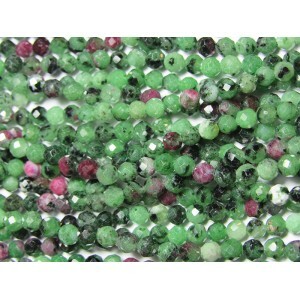 Zoisite Ruby ( Anyolite ) Faceted Rondelle Beads 3 - 3.3mm, 15.5'' strand. ..
Zoistite with Ruby Round faceted 4mm BeadsApprox length 15''..